With the crazy-late night we had before we left Ohio we haven’t been making the best time as we travel. On the flip side we have met some great people and are managing to catch up on our sleep (in the hotels…not while we drive). 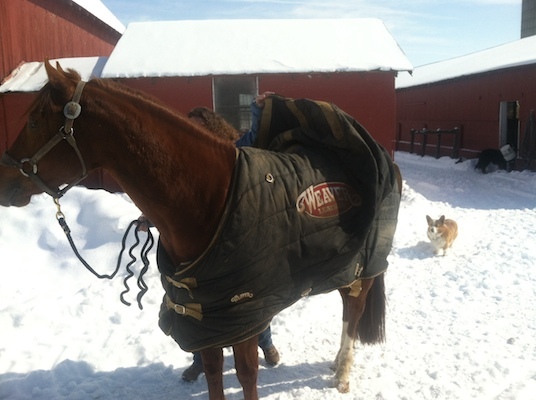 Most of our horses were blanketed this winter in Ohio which is going to come in handy with this move to Texas. As we travel we need to take the ever changing temperatures into account as well as the idea that the horses are working a bit as we travel. Here you can see Jac is taking off a layer before loading up in the trailer. Today as we travel we will be leaving while it is 30 degrees but within two hours of driving it will be 59 degrees and will be 69 degrees later than that. With five horses in the trailer the plan is to take blankets off and then regulate the temperature by keeping the trailer closed up at the beginning and then opening rear windows as needed. It is important to remember to leave some windows in the rear cracked because five horse breathing in the trailer does create a lot of condensation. Have you ever noticed in the cold weather that a car load of people in a vehicle makes the windows hard to keep defogged? Same idea but inside the horse trailer. Signing off for now, I have to go load up horses. Jac is almost as excited about being ridden as I am about riding him…lol. He is so full of energy because I didn’t ride him the last few days in Ohio as we packed and he is very, very fit from being ridden in 20 degree weather at home. I hope he and Newt behaved last night in their side by side stalls. Maybe I will ride in the next few days? ← Doing everything vs doing what is important quote. Happy trails, God traveling guys! Bowie is only 85 miles from where I live. Wouldn’t it be great to see Stacy work in person? And I’m not even a rider! Happy Trails! Hope all goes well with rest of your trip! Stacy, I am so glad Joan here in Missouri could help you in your journey! Thanks for the update and safe travel! So glad your coming to Texas, hope you have a clinic or something on my days off. Have a wonderful time while your here. Where in Texas are you heading? We live just south of the Kyle Ranch near Collinsville. Just north of Tioga. When you get here you will love the weather next week…60 to 70’s! Welcome to Texas! Moved down from Iowa 4 years ago. Please post where you will be…have been following your story with Jac and very much learning and enjoying! Safe travels! 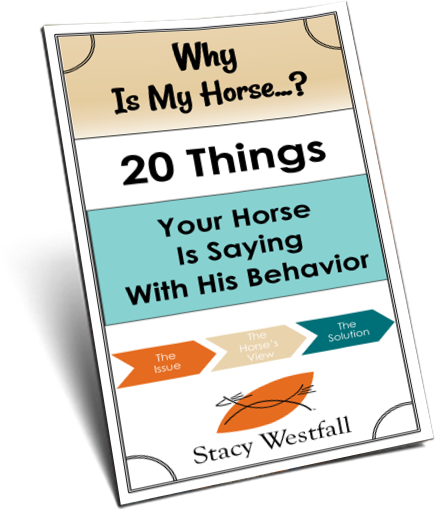 Lindsay-We took both personal and client horses with us. We did recommend that some clients who rode with us move their horses to other local trainers so they could continue to show in Ohio. We will see what the future brings as far as shows:) Yep, you will be getting more info as we go…and you can keep asking questions! I plan someday to move with my horses from Indiana to New Mexico so we’d be traveling much the same route as you head towards Texas. 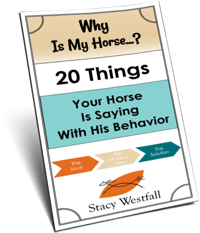 I’m taking notes from your blog to see “how far you travel in what timeframe” and also notes on the places you are staying overnight with your horses. Hopefully that information will come in handy for us if we are ever able to make it out of here. Thank you for allowing us to make a “virtual practice travel run” with you!